Vitamin C is a product, which appears in the form of powder of white color. It contains at least 97, 5 of ascorbic acid. In manufacturing of pre mixes and mixtures for nutrition of all land animals. Deficit of vitamin C causes scurvy. By its chemical composition vitamin C is ascorbic acid, which is colorless, of crystal structure and water-soluble compound. It is diluted hurriedly if exposed to son light. Majority of mammals and birds, including domestic animals possess ability for synthesis of ascorbic acid from glucose (glucose) (fruit sugar) of adequate quantities. Commonly, biosynthesis of vitamin C is carried out in liver, but with poultry in kidneys. Normally, it is not necessary to provide vitamin C in meals of domestic animals. Among nutrients of animal origin, only milk is source of this vitamin. Although needs of domestic animals are satisfied by synthesis in tissues, it is frequently said that stress, by unfavorable conditions of outside environment (increase of temperature and humidity of air) may increase needs for vitamin C, and under these conditions animals may react to vitamin present in nutrition. In contemporary poultry farming, factors of stress, like transportation, growth, heat are impossibly to be eliminated completely. Under conditions of extended stress, a level of vitamin C in plasma drops down allowing non-controlled extraction of kortikosteroids and eventually reduction of ability. This effect can be alleviated by adding of vitamin C, making possible maintenance of productive functions on a higher level, despite stress, and decrease of mortality caused by stress. Beside that, skin and epithelium tissue, with collagen as a main component, it represents a barrier against penetration of pathogenic organisms. Since vitamin C is indispensable for regular synthesis of collagen, lack of the same weakens resistance, letting pathogenic organisms penetration. State of organism in the course of microbe infection requires sufficient additional quantities of vitamin C, larger than those which some of animals are able to synthesize. 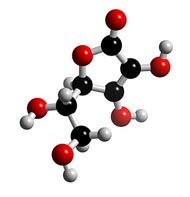 Vitamin C is directly included in conversion of vitamin D3 in its active metabolic form holecalciferol. Vitamin D3 activated is indispensable for optimal absorption of calcium from bowels in bones. The latest researches show that an addition of vitamin, nutritional vitamin C, is indispensable to young and older animals for optimal homeostasis of calcium, good metabolism, normal production of eggs and an adequate quality of eggshell. Besides, it ought to be mentioned, that in the first few weeks of life calves have limited capacity for synthesis of ascorbic acid. Provision of sufficient quantity of vitamin C, with calves, is usually achieved through milk.